I changed my mind about not blogging just to write (and crudely Photoshop) this post – here are 3 Halloween costumes Asians can’t wear. 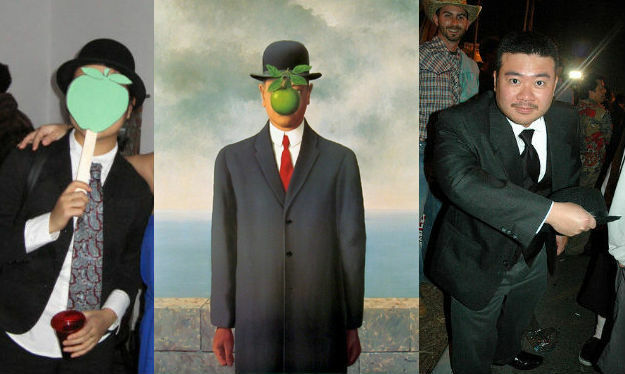 In 2005, I put on a bowler hat, drew an apple, and went out as Magritte’s “Son of Man” painting. When I wasn’t holding the apple in front of my face, someone asked if I was Oddjob, the James Bond Villain. My friend Mariko is kind of short. Here she is dressed as Karl Lagerfeld in 2008. 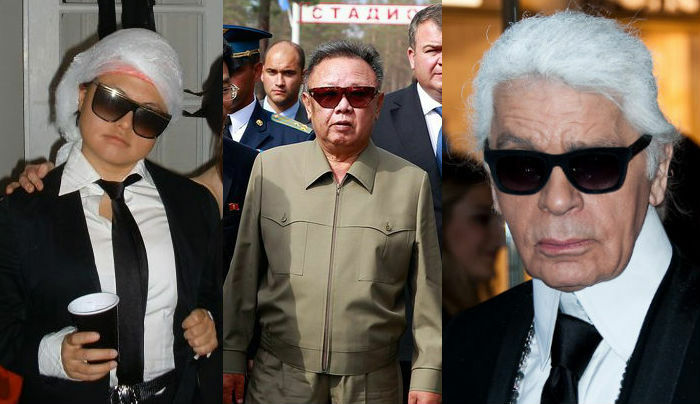 Unfortunately, people thought she was Kim Jong Il. Here’s Ken Jeong’s character Chang dressed as a famous figure skater on the 2010 Halloween episode of Community. And just to balance things out – here’s a Halloween costume no non-Asian should wear. “Magritte TheSonOfMan” by Shimon D. Yanowitz – Shimon D. Yanowitzשמעון ינוביץ. Via Wikipedia. Kim Jong Il photo modified from www.kremlin.ru. “Karl Lagerfeld 2014” by Christopher William Adach – http://www.flickr.com/photos/adach/14071166986/. Licensed under CC BY-SA 2.0 via Wikimedia Commons. This entry was posted in Uncategorized and tagged asian, halloween, pop culture, race, tv on October 15, 2014 by Eveline Chao.